I was fairly lost for a few hours because radioButtonStyle was clearly working on everything except for the widget popup. I could insert RadioButtons into my Activity and they'd pick up the new style, but the old style would remain for the action bar. What was going on? Introduced in API 14, what it does is let you style Views inflated by the action bar separately from the rest of your Application or Activity. This is a neat trick, but if you don't know it exists, you could easily get lost on why your styles aren't applying to action bar Views. If android:actionBarWidgetTheme is undefined, it falls back to the current theme's values. For most Android themes, that means you're fine. 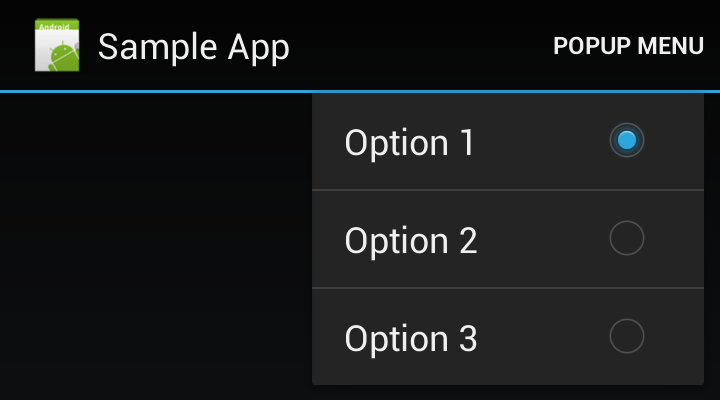 But in the case ofTheme.Holo.Light.DarkActionBar, it does set the actionBarWidgetTheme to @android:style/Theme.Holo. As a result, it will not fallback to your theme's default value. It's important to properly parent the actionBarWidgetTheme with whatever the theme was previously setting as its parent; otherwise you may miss out on some styling elsewhere.